Movie Review: Passionately directed by Steven Spielberg, “Bridge of Spies” doesn’t belong to those conventional espionage thrillers we normally come across with. The film, which recreates a laudable true story, counts with brilliant performances by Tom Hanks, Spielberg’s habitual first choice, and the highly praised English stage actor Mark Rylance whose brief appearances and words are simply unforgettable. The script by the Coen brothers and Matt Charman, despite lacking vigorous action scenes, reveals a humane side that is much welcome and unfolds with a gracious coherence and an inherent subtle tension. The year is 1957, in plain Cold War. Rudolf Abel (Rylance), a long-time soviet spy operating in the US, is caught by the FBI and arrested. The one designated to defend him is the Brooklyn attorney, James B. Donovan (Hanks), who truly believes Abel has the right to a fair trial as everybody else, regardless the opinion shared by the majority of the population that he should immediately be convicted and sent to the electric chair. During the preparation for the defense, Donovan and Abel develop a sincere admiration for each other based on the respect and loyalty they’ve always dedicated to their duties. As expected, the impassive Abel is convicted, but Donovan was capable of persuading the biased judge not to give him the death sentence, suggesting instead that they keep him alive for a possible future exchange of prisoners, in the case of an American spy falls in the hands of the Russians. Believe it or not, that was exactly what happened when the American pilot Francis Gary Powers was captured during a spy mission in Soviet territory. The CIA’s only concern is to retrieve Powers, but the straightforward Donovan decides to negotiate beyond that. He’ll attempt to exchange Abel, not only for Powers but also for Frederic Pryor, an American student who couldn’t avoid an inopportune detention occurred in East Berlin. 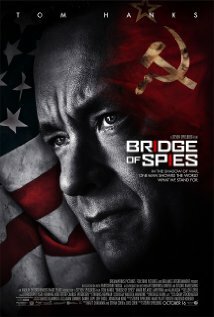 “Bridge of Spies”, flowing with seriousness, wittiness, and elegance, uses mainstream strokes to paint the portrait of a real hero and his magnificent deeds for his country. It’s an immaculate film in terms of period recreation, visual consistency, and narrative fluency. Here, the stimulating chases and wild shootings are discarded; instead, you have the chance to appreciate the finesse of a true classic. A feel-good touch comes in the last scene, when the exhausted Donovan, lying in bed, is regarded by his wife with a mix of incredulity for what he just did and a profound veneration for who he is.